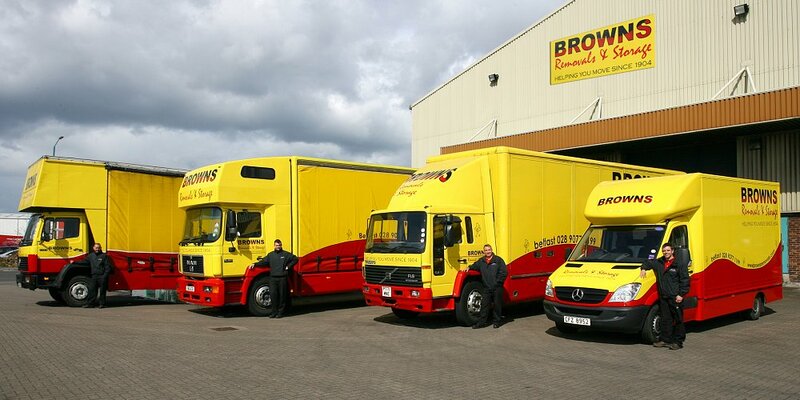 Browns Removals & Storage has been helping move homes and businesses for over a century. James and Elizabeth Brown, pictured below, established the company in Belfast, Northern Ireland in 1904, under the general trading name of James Brown & Sons. Starting out with just a horse and cart they delivered everything from furniture to coal. Brown’s quickly became known for its expertise, professionalism and community-centred approach. With the growth of the business, their transport fleet expanded and modernised and they quickly outgrew their premises on the Belmont Road. In 1936, they moved to new facilities on the Newtownards Road. The Brown family name became to be well known, trusted and highly respected for their work serving the local community. Browns grew from strength-to-strength throughout the twentieth century. The removals side of the business continued to expand and traded under name of Browns Removals & Storage. In 2003, Keith Acheson purchased the firm and expanded the business by amalgamating with Tweedy Acheson Removals. In 2008, Browns was taken over by its current owner Fenton Archer who brought with him 25 years experience in the industry. At Browns Removals & Storage Belfast, we have a heritage and reputation that we are extremely proud of. We pride ourselves on upholding the high standards that were established over 100 years ago by James and Elizabeth Brown. The company continues to grow and modernise through delivering the highest levels of service at excellent value. With Browns trusted name and extensive experience you can rest assured your shipment is safe with us. You will have the peace of mind that comes with a firm that really knows what it is doing. Rely on us to help you move. Request a call-back today. Browns are a member of the British Association of Removers (BAR). As a BAR member, Browns work to an OFT-approved Code of Practice. We have met stringent criteria and are regularly inspected to ensure that our staff, vehicles, premises and facilities meet the required standards set out in the Code of Practice. By using Browns you can be confident that we will be properly and professionally equipped to carry out your move, whether domestic, commercial or international. If you would like to find out more, you can download the BAR Code of Practice here. Browns are also members FEDEMAC European Movers and the International Association of Movers (IAM).